There are many kinds of dog houses, and the style and size must, of course, depend upon the dog and the situation. 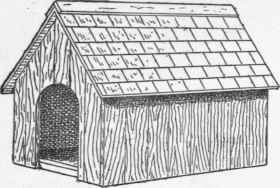 A good dog kennel (Fig. 187) for a small dog can be made very much as you would make a box (see box-making, on this website). 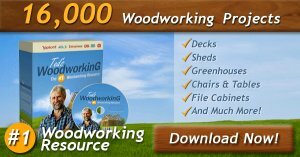 If for a very small dog the ends, sides, floor, and sides of the roof can each be made of one piece, but ordinarily these parts will each be made of two or more pieces. Matched boards are suitable. First get out the bottom, then the sides and ends. If you use boards with square edges you must of course use pieces of different widths, so that the cracks between them will not meet at the corners, or put posts at the corners. This is the best way to do with matched boards, if the house is at all large. Nail these parts together. It will be easiest to cut the slant at the top of each end - the gable - so that the sides of the roof will meet in a right angle. This looks well and saves the need of bevelling the edges of the roof-boards. An opening for the doorway should be cut in one of the ends before the roof is nailed on. If you do not use matched boards, a strip should be nailed on the inside at each side of the doorway, to keep the boards together. The roof-boards for one side should be as much longer than those for the other as the thickness of the stock. The same applies to the width of the saddle-boards which cover the extreme top. If the roof is not made of matched boards, battens should be nailed over the cracks. For a large dog a kennel should be built more like a real house and not so much like a box. A structure with a frame (Fig. 188) can be built of any size suitable for a kennel, and will be more durable than the preceding form. For the frame, small joists, or strips of plank of any size from 1 1/2" x 2" to 2" x 3" can be used. First get out the sills or bottom pieces of the framework, nailing them together at the corners to form a rectangular frame, as shown in Fig. 189. Then get out the corner posts and fasten them in place, and on top of them fasten the plates (a second horizontal frame like that at the bottom), and see that all this framework is rectangular and free from winding. The sills and plates can be halved at the corners, but this is not really necessary in so small a house, as the boarding adds strength to the joints. The frame can be temporarily held in place until the boarding is put on by nailing on as many diagonal strips (Fig. 189) as may be required. Two rafters at each end should next be put in place, their ends having been cut at an angle of 450 and the upper ends being nailed to a strip of board which serves for a ridge-pole. An intermediate rafter on each side will add stiffness to the roof. The floor should next be laid, as it will be inconvenient in so small a house to do this after the sides are put on. The sides and endsshouldbe boarded with sheathing o r matched boards laid vertically, cutting out the doorway and a small window in the back gable for ventilation. The roof can next be laid with the boards running horizontally, or lengthwise, as this house is to be shingled. The shingles can be dipped in creosote stain or paint to good advantage before laying. After the roof has been shingled the saddle-boards can be put on and the house will be ready for painting. Another form of doorway is shown in Fig. 189a. "The best device is an ordinary single kennel forty-eight inches by thirty-three inches, with an A roof, but with a detached bottom of the same size as the outside ground measurement of the kennel. This bottom is hinged by two stout strap-iron hinges to the side of the kennel, and is provided with two wooden axles, to which are fitted four wooden wheels, say four inches in diameter. When closed it looks like any other kennel on wheels. It can be easily moved by one person from damp spots, etc. ; and by turning the kennel back upon its hinges the bedding can be daily sunned and aired and the kennel washed and purified without trouble. The wheels also serve to keep the bottom clear of the ground, and allow of a free circulation of air beneath."